How to modify theme in Gmail- will show you how can you use the custom themes in Gmail or modify the themes in Google mail Account. People wish to modify the look of Gmail appearance according to the mentality and the mood. So Gmail has a feature to customize theme in Gmail Account. You can change the theme in Gmail from the default themes (featured themes) of Google or use your own photo as background image in Gmail. Change in theme will not affect the messages. It only modify only the appearance of the Gmail. 4. Navigate to “Themes” tab. Scroll down the horizontal scroll bar to view the available themes in gmail. 5. Now click on the theme you want to set for Gmail background. It will refresh the active gmail window and the modified theme will be activate on your Gmail. You will get four category for Gmail themes. 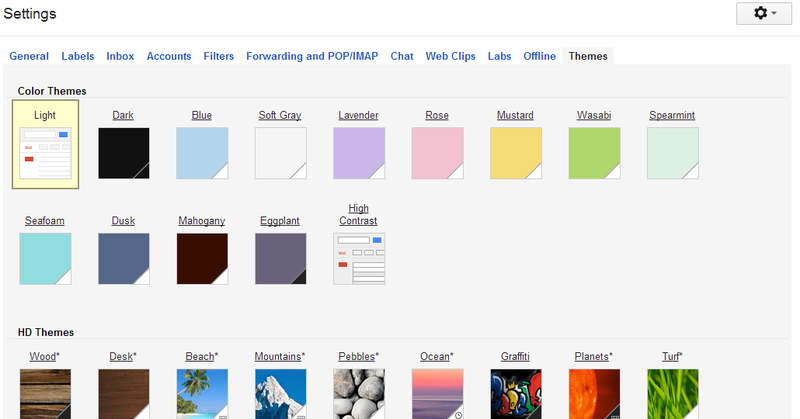 Color Themes: Some color full themes are available for Gmail. HD themes: Some high definition nature category theme are available for Gmail. Custom Themes: You will free to modify the background by uploading your own photo or select a photo from the featured photo. Classic Themes: Some Classic style themes for Gmail are available.